Octavine Illustration. Garnering inspiration from the sensuous lines of Art Deco haute couture fashion, advertising and poster art, I specialize in Art Deco and Art Nouveau inspired Ketubah (Jewish marriage contracts), custom name plates, baby name certificates, wine labels, concert posters and programs and anything both Hebrew and English calligraphy related. My goal is to construct a world based on Art Deco and Art Nouveau forms, classic silhouettes of sleek sophistication, where style and craftsmanship reigned supreme, nurturing the creation of a product solely for its beauty. Imagine the 1930s era of Hollywood movie stars, the Chrysler Building and the Duesenberg. Based in an 1880 Victorian in Marin County, California, Octavine Illustration is owned and operated by illustrator, calligrapher and Ketubah artist Cara Buchalter. Born and raised in New Mexico sweeping my father’s sculpture workshop and playing hide-and-seek in galleries throughout the Southwest, I then moved to beautiful Artists’ Quarter in Tzfat (Safed), Israel where I began my craft: illustrating and creating letterforms rhythmically; blending artistry and function. 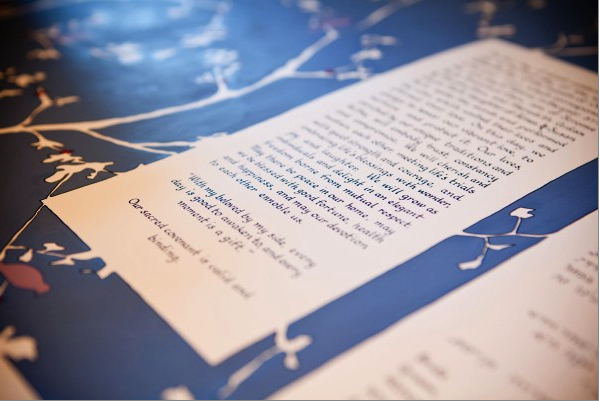 The Ketubah seemed the perfect medium; a technical legal document elevated to an object of beauty and meaning. I use gouache and ink to create my illustrations and ketubah. Specifically (for you calligraphy geeks out there), a 1940s Osmiroid lef-hand pen or a 1920 Waterman left-hand fountain pen. Custom orders/commissions are always welcome. Octavine Illustration is owned by ketubah artist, illustrator, and calligrapher Cara Buchalter. Based in Marin County, California, Octavine lllustration serves clients both in San Francisco as well as around the world. Please see my BUZZ to hear what others say about their custom Art Deco ketubah by Cara Buchalter of Octavine Illustration.